Rebecca Styn suggests you ought to know One World Tribe. And with a chance to see them live this weekend, you can get to know them in person after reading her profile. With a musical style rooted in West Africa but also deeply infused with several other genres, One World Tribe delivers a series of stylistic influences—from reggae to New Orleans, soul to funk, hip-hop to jazz, and salsa to Latin. The combination of which could very well have created a cacophony—not only within the group—but also in the music they would ultimately deliver. But, instead, it evolved into a euphony of melodious kinship, creating a worldly blend that inspires even their most questionable critic. They are a group that is not only ever present, but tenacious in its quest to continually uplift those around them. Befitting them for what they are today—a true multicultural ensemble. Kennedy Thompson, a classically trained and established local musician whom still directs the group today, founded one World Tribe in 1994. In a brief discussion with Thompson at the Erie Art Museum, I asked him what inspired him to start such a large-scale project. "I was into a lot of different styles of music," he tells me. "Ethnic, afro-centric based styles. I wanted to put something together where it wasn't just any one style, but rather a number of them, all with a common denominator – a genre rooted in West Africa." I also happened to share a common denominator with Thompson – we both graduated from the D'Angelo School of Music at Merychurst College. Thompson holds a degree in percussion while mine is in piano performance. Yet, unlike myself, Thompson has been blessed with opportunity to create a professional life out of his music – something that is rarely seen these days. And although we attended the school at different times, we were both fortunate enough to have studied under an established figure in the percussion world: Mark Marchant. Mark was a consummate performer in the local music scene—a founding member of One World Tribe, a percussionist with both the Erie Philharmonic and the Erie Chamber Orchestra, and was also a highly regarded conga player, well versed in Latin and Afro-Caribbean rhythms and styles. But unfortunately for us, his family, and the rest of the music community, Mark passed away back in 2006. He was only 52 years old. I asked Thompson to sum Mark up in a few words. "You just can't replace a guy like Mark. When I was at Mercyhurst, he was the connection to the 20th century. He was so competent at any style of music—whether it was classical, contemporary, Latin, or anything…you just don't find many musicians like that today." And while One World Tribe has only gone through some transitioning over the last 17 years, the 12- piece ensemble still has much of its core group. Aside from Thompson, the founding members include: bassist Mike Chin; drummer Kenny Hollis; guitarist Frank Singer; and vocalist Preach Freedom (aka Ron Williams). Other newer members include: vocalist/drummer M'Baye Rama Diagne; percussionist, Ringo Brill; vocalist Lauren Hughs; vocalist/keyboardist Kennedy Lorya (aka Dynamq); vocals/percussionist John Norton III; drummer/percussionist Baba Raymond Sylla; and drummer Mark Collicchia. Most of the musicians are also song-writers. Many of them also have international roots. Chin hails from Montego-Bay, Jamaica; Dynamq is from the Sudan, and M'Baye hails from Senegal, West Africa. Their education truly covers the gamut—several self-taught, and many holding degrees from great colleges, including Singer, who graduated from the prestigious Berklee College of Music. Their music has also continually evolved. Originally, the band performed mostly covers including music by Bob Marley, Santana, Ruben Blades, the Meters, Stevie Wonder, and Johnny Klegg. Today though, original music has surpassed much of the cover material. They even have three original albums to their credit in: "Unity & Diversity," "The World Today," and "Armed and Dangerous." "Today, we travel all over the east coast performing in venues that span from Rochester to Atlanta, Georgia. Because we travel so much, from time to time we are rumored to have split up," Thompson says with a small laugh. "Of course that's completely not true. And we want our fans to know that." As for 'legendary' moments they've experienced, "We opened for the Wailers on many occasions," shares Thompson, "though by far one of my favorite experiences has been opening for renowned funk band, War. We kicked off the Party in the Park for them in Buffalo, New York, in front of 20,000 people. It was amazing. Plus, we got to hang out with them afterward. For those of you from another planet, the band War has had a profound influence on contemporary American music over the years, having sold nearly 50 million records with hit songs such as "Why Can't We Be Friends, and "Cisco Kid." And they're still keeping with the times—not only has their music been reproduced in commercials, television shows, and movies, but also in videogames, including; Grand Theft Auto and Rockband to name a few—continually treating many generations to their movement…eh, music. 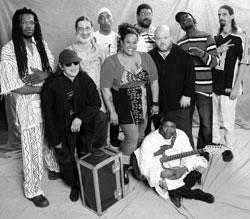 As for One World Tribe, in addition to their music, many of the group's performers are also professional educators. The group has had many opportunities to take their expertise into school systems, colleges and universities, and community service centers. According to Thompson, "today we share these experiences through a variety of workshops. It's a great way to educate students on West African rhythms and the function of many instruments in and around the ensemble. We also offer lectures, as well as clinics and residencies." As for the band's influences? "There's so many. Bob Marley and Santana of course. The Neville Brothers and the Grateful Dead are also inspirations—but these are just a few." And as for Thompsons own personal inspirations. "I was classically trained – so I was able to learn so many different periods of music. Some of my favorites are Chick Corea, Miles Davis, Santana, and Charlie Parker. I also love the late romantic artists, such as Richard Strauss and Richard Wagner." That's quite a mix I told him – a mix of greats – many that we sadly don't listen to anymore. Through this, I came to understand why Thompson couldn't settle on any one style when he started the ensemble. His appreciation and understanding of many of the genres only led him to believe it was most natural to encompass as much as he could. It just wouldn't have felt right otherwise. As Thompson credits Miles Davis, "When you can see something in music – something that you have to do – you immediately know – you just have to head in that direction." And that's exactly what Thompson did. One World Tribe will be performing at the Erie Art Museum's one-year anniversary gala this Friday, Oct. 7. Appropriately titled, One Year. One World. One Night, the event offers (in addition to the great music), art from America and around the world, paired with authentic Asian, Mediterranean, and Southwestern fare. Oh, and an outdoor hookah lounge, traditional henna tattooing, and a few surprises, too. Call 459.5477 for tickets.